Docs Weapons wanted to be found on Google. Their old site was a one page design with very minimal content, which is not good in the eyes of Google. 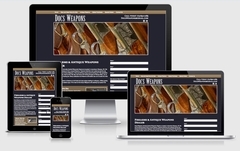 Working with Virtual Vision, Docs Weapons now has web pages for each service with content and images. We created a custom form for Doc to receive requests from customers looking for specific weapons that they may be unable to find. If you need help getting found on Google, we can help. Contact Virtual Vision today for more information.